Missed your periods? Noticed symptoms of early pregnancy in you? A lot of anxiety builds up whenever such a situation of doubt arises, and it is worse when the doubt is about being pregnant or not. You look for the every behavioral and physiological (functioning of the body) change in you. It is mentally tiring to look into different guides or read several reviews about pregnancy test kits. Stop guessing and get a sure answer to your doubts! This will prove to be the best and most assuring U-Check Pregnancy Test Strips Review for both the kind of women – whether you want to conceive or suspect an unwanted pregnancy. How does U-Check Pregnancy Test Strip work? How to use U-Check Pregnancy Test Strip? U-Check Pregnancy Test is a strip pregnancy test. There is no holder for the strip, neither a well for dropping the sample (urine). Also being a strip pregnancy test it is a single slot reader, both the lines – Control line and Test line will appear in close vicinity. First of all, we have a list of symptoms to check whether you need to take the Pregnancy Test. It is critical to be sure whether the pain is from the cramps due to implantation or some other gynecological issue. Implantation cramps occur when the embryo attaches to the uterus wall. Risk factors mean the incidents that make you vulnerable to getting these symptoms. They are in the sequence they must appear. It means that the first one should happen first to validate the next for this situation. However, every individual is different. So here we cannot formulate a uniform rule chart. For a complete step by step guide to tracking your ovulation refer to the blogs about ovulation from our other blogs. It may change depending on the place from where you have bought it. Standard data says that you get a big box with 6 small packs, each having 1 strip. Every device is sensitive after your body reaches a particular threshold hCG concentration. The lower the threshold, the better the pregnancy test is. The sensitivity of a pregnancy test strip also depends on the minimum level of hCG hormone detected by the dip strip. This decides the Pregnancy Test accuracy. U-Check Pregnancy Test Strip can detect hCG level around 25 mIU/mL. The ideal time for using a specific pregnancy kit depends on the sensitivity of the test strip. U-Check Pregnancy Test sensitivity is the lowest possible concentration of the hormone hCG that it can detect. Human Chorionic Gonadotrophin (hCG hormone) starts coming with your urine after conception. As the minimum level detected is 25 mIU/ml, you should ideally use this pregnancy strip early morning. Your urine gets concentrated overnight and has higher hCG in morning sample. The U-Check Pregnancy strip gives accurate results after 11 days from ovulation. If you count from your menstrual date, it comes to 2 – 3 days before your due cycles. It does work for some females even before 3 days from periods, but chances of false negatives are very high up to 40%. However, the U-Check Pregnancy Test Strip has the most accurate (nearly 99% accuracy) results on the day of your missed periods. The U-Check Pregnancy Strip has a patch of antibodies attached to it. These are small particles that can attach to the hormone hCG present in your urine. This hormone comes in your urine only when you have conceived. When these antibodies attach to the hCG particles, a chemical reaction takes place which leads to color. For the control line, it doesn’t need hCG to show the color. It reacts with your urine contents to give the color. It will validate the reliability of the U-Check Pregnancy Test Strips. Take a clean disposable cup, ideally a fresh one and collect a sample (urine) and place it on a stationary surface. 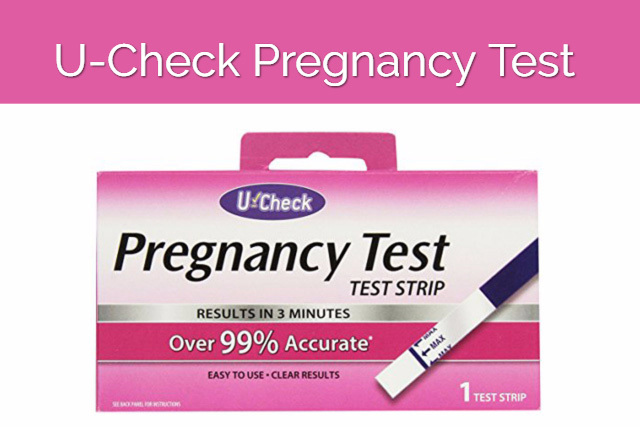 Clean your hands and pat dry and carefully remove the U-Check Pregnancy Test Strip from a box. Hold it from the tip and dip it in the urine till the mark for urine. Keep it straight inside the cup contents for 10 seconds briefly, don’t shake it neither drop it in the cup. Now place the strip on a nonabsorbent mat and wait for three minutes. Read the results within 10 minutes that is 7 mins after placing it on the mat. Discard the strip as the test results will vanish or become corrupted with time. It is unhygienic once you immerse it in the cup contents. Take early morning urine. Early morning urine sample has a higher concentration of hCG. Do not drink caffeine products or excessive water. Get up and straight away get going for doing the Pregnancy Test. The U-Check Pregnancy strip should be as sterile as possible. Discard the test if you make any mistake while taking the test. Keep the strip the straight and hold it from the extreme opposite end, don’t leave it touching the wall of the cup. The mat on which you will allow the strip to form the results should be nonabsorbing. Do everything following highest standards of hygiene. Always place the strip facing upwards. Negative result: A single pink line appearing indicates that the apparatus is in good condition. The conclusion is that the test has a negative result. The negative result confirms that you are not pregnant. Positive: Two pink lines means the test has a positive result. The positive result confirms that you are pregnant. No lines or lines of other colors: The apparatus is not functioning correctly. The conclusion is the test is invalid. It may be a U-Check Pregnancy Test false positive result. Lines of other colors give False-positive results. How does a False positive look? It is just like the positive result. A faint positive test result is not a false result. Very faint lines appear when you take the pregnancy test too early. Colorless lines: These are evaporation lines formed from your urine contents which could not dry up or evaporate. These test results don’t say anything about your pregnancy. A False negative is not very uncommon. The U-Check Pregnancy Test strip is a very fragile kind of pregnancy test. It needs a lot of care while performing the test. It has had a lot of incidents of showing evaporation lines. Evaporation lines form due to urine pigments that left behind after the urine evaporates. Always duplicate your test after 2 days (48 hours) no matter how accurate the home pregnancy test strip or kit is. The level of hCG doubles every 48 hours, so chances of a false negative (showing negative for a pregnant female) reduce. One should not rely on over-the-counter pregnancy tests entirely. U-Check brand is moderately accurate. It needs a little practice for handling. U-Check Pregnancy Test accuracy surpasses most cheap pregnancy tests. The chances of getting a correct positive test on the 10th-day post ovulation are around 40% only. As the days near your due cycle, the accuracy of the result is more probable. You will have 88% probability of getting the right result on the 11th-day post ovulation. On the day of your expected periods, there is a probability of 99% U-Check Pregnancy Test accuracy. You don’t get a disposable cup. U-Check Pregnancy Test strip is a fairly good pregnancy test. It is ideal for those females who intend to conceive and can wait for a while to confirm. The test strips have particles (antibodies) that are sensitive to moisture. So store them in clean and dry conditions if you are planning to stock them. Never keep an opened pack. The surroundings will contaminate it. It is not for the females who want to detect a negative pregnancy test and are anxious about an unwanted pregnancy. All in one U-Check Pregnancy Test strips are cheap pregnancy tests for those who need confirmation before seeing their doctors. Previous articleWhat Is Implantation Bleeding? Next articleAre Cheap Pregnancy Tests Accurate? If three pregnancy tests were negative then consider waiting before next test. White line is most likely u check pregnancy test evaporation line. You must read the instructions for taking a pregnancy test. Don’t panic and take a pregnancy test after two weeks from missed period day. Hey I’m try to read my pregnancy test . I’m try to read my pregnancy test can u help by I take a picture or the test. Yes, send us a picture. How likely am I to get a positive if I test 8dpo? Hi, thanks for a great article. I just used the U Check pregnancy test and I have a single line in the center, rather than in the c or t area. What could this mean? Thanks. Maybe the test is defective and the strip isn’t in the right place. You’re taking tests before missed period? Get a blood test. In case you want to use u check pt then take test early morning for two consecutive days and go with the results you get. I got 3 positive n 3 negative test ?